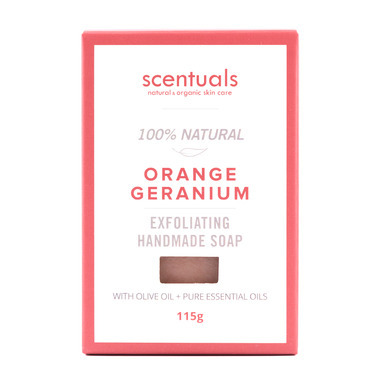 Bright and uplifting orange and geranium come together to make every cleansing experience refreshing and revitalizing. Coconut and Olive oils deeply condition and hydrate. 100% natural, handmade and cruelty free. Gentle, for everyday use. Handmade with the bright and uplifting scents of pure orange and geranium essential oils. Cocoa seed butter and nourishing Olive, Palm and Coconut oils moisturize and protect skin. This 100% natural soap creates a rich lather and gently cleanses while hydrating. Highly recommended for people with sensitive skin, eczema or psoriasis.